Yellow Archangel, Lamiastrum galeobdolon, flowering shoot. Photo: Paul Kirtley. Yellow Archangel, Lamiastrum galeobdolon, is a widespread European woodland plant that is fond of heavy soils. It will grow in very shady areas but also likes some sun and can pop up in abundance in areas that have been coppiced. It can also be found on waysides and verges. In the UK the plant is found more in the south and is relatively widespread as far north as Yorkshire, but less so in the west of the country. Yellow Archangel, Lamiastrum galeobdolon, growing in woods, East Sussex, May. Photo: Paul Kirtley. 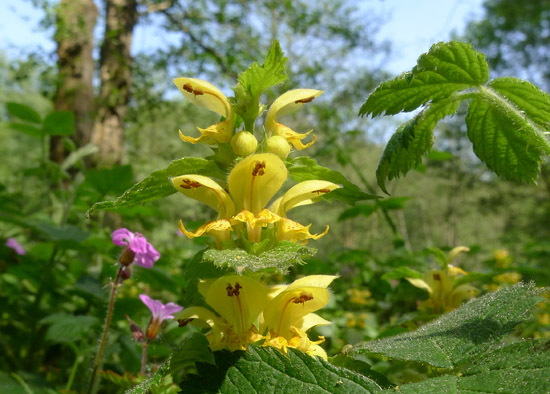 Yellow Archangel is in the family Lamiaceae along with dead-nettles and mints. 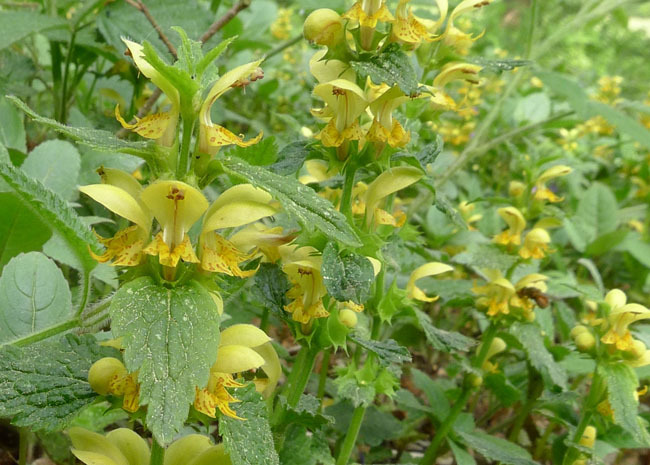 It has attractive yellow, hooded flowers that appear from May to July. When in flower you can clearly see the family resemblance to White Dead-nettle, Lamium album. More generally, Yellow Archangel shares the Lamiaceae family traits of having a stem with square cross-section, and opposite pairs of leaves alternating at 90 degrees to the pair above or below on the stem. The leaves are a similar shape to White Dead-nettle but narrower and more deeply toothed. The flowering stem can grow up to 45cm tall but is often shorter than this. Yellow Archangel, Lamiastrum galeobdolon, Flower and leaf detail. Photo: Paul Kirtley. 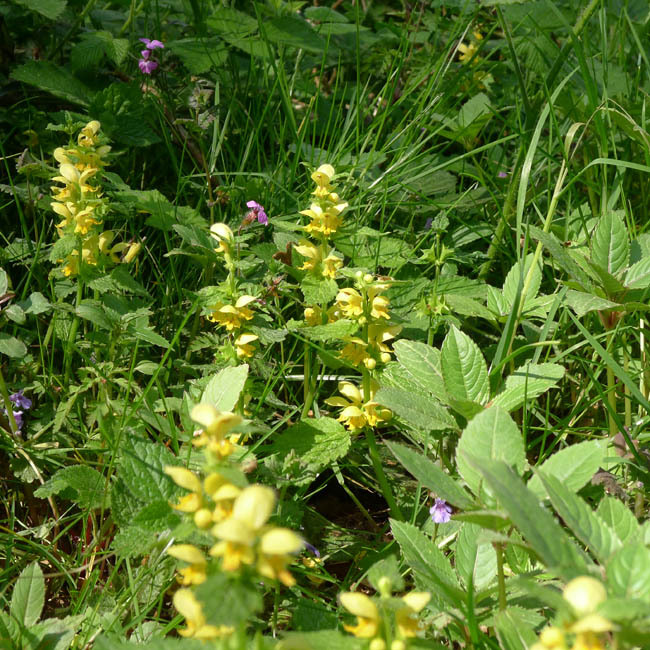 Yellow Archangel is edible and the plant can be used in the same way as White Dead-nettle, Lamium album. The young leaves and shoots can be eaten raw. Later, when the plant is more mature, and the leaves are tougher, you can steam or lightly cook the leaves and eat as a green. At any stage you can add the leaves to soups as you would the leaves of Stinging Nettle, Urtica dioica. Hi Paul, I like your last posts! Keep up the good work! The only Yellow Archangel I’ve come across in my neck of the woods (mid-Cornwall) is the variegated garden-escape variety that seems to be quite invasive in the local woods. Have you come across this, and is it as edible as the wild-type? Both varieties are quite prolific where they occur. The variegated garden-escape is edible in the same way as the native variety. Nice to see this here and good to stumble upon your blog. Do you mean rare in the South East rather than South? It is not so rare in the South West, it was quite common in South Devon. I’ve nibbled on this raw but to be honest the flavour wasn’t so great that it made me rush out and cook it, is it worth it, got any good recipes? Does the variegated variety flower every year ? There is a patch growing on a woodland verge here in my part of Lancashire. I have only seen it flower though once in four years – a spectacular sight ! It is a perennial but that doesn’t necessarily mean it flowers every year.